Your adventure awaits. Lake Koocanusa offers so many opportunities; a relaxing day fishing in the sun, late night campfire songs and star gazing, or swimming at dawn to the lyrical call of loons. Wonderful memories are easily made here. The Sunsurfer is a great boat for entertaining and larger groups. This boat has had a number of upgrades including new floors, all new furniture and window coverings. People love this boat for its open kitchen living layout and multiple sleeping areas. It even comes with an original copper ballast pole for that extra charm. 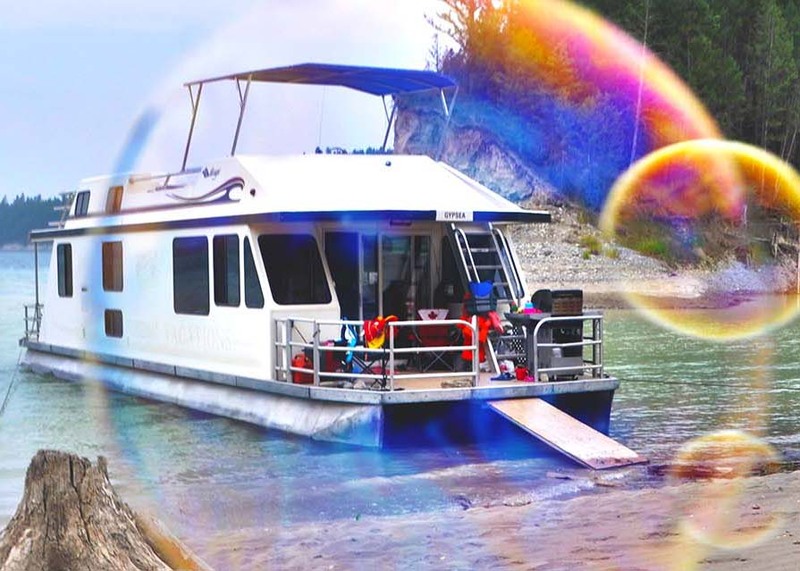 The Sunsurfer was built during the era when houseboats were as simple as an rv with limited outlets so do take advantage of the break from technology. The top deck has multiple levels to hang out on and due to this we find it best suits groups with no children under the age of 6. You’ll be sure to get the most of the lake and visiting on this boat.